Propolis has a complex chemical composition defining antibacterial, antimycotic, antiviral, radiation, anticancer and antitumor action. Propolis contains nineteen compounds of different chemical structure. These compounds include a number of substances belonging to the flavonoid family. According to medical researchers, the propolis is rich in: Vitamin A (carotene), Vitamin B1, Vitamin B2, Vitamin B3, Biotin, Bioflavonoids, Albumin, Calcium, Magnesium, Iron, Zinc, cobalt. Propolis contains 500 times more bioflavonoids (vitamin P) than in oranges. With the exception of vitamin K, bee has all known vitamins. 15-20 drops in a glass of lukewarm water in the morning before a meal taken prophylactically. Influenza, cough, angina and inflammation Linfen - recommended 3 times daily 20 drops 20-30 minutes before eating. In fever 5-10 drops in 10 ml of water were used as nasal drops. Several times a day 3- 4 drops in each nostril. propolis tincture shows exceptional effects in diseases of the oral cavity - cold sores, ulcers, gingivitis, periodontal disease, glossitis, stomatitis and diseases of the skin - superficial injuries, acne, pustules, cracks, herpes. Skin diseases, as well as those in the oral cavity can be processed by pad soaked in tincture. Diseases in the oral cavity are recommended gargles with propolis tincture in water (ratio 1: 14 - 1 ml. Tincture in 14 ml. of water). 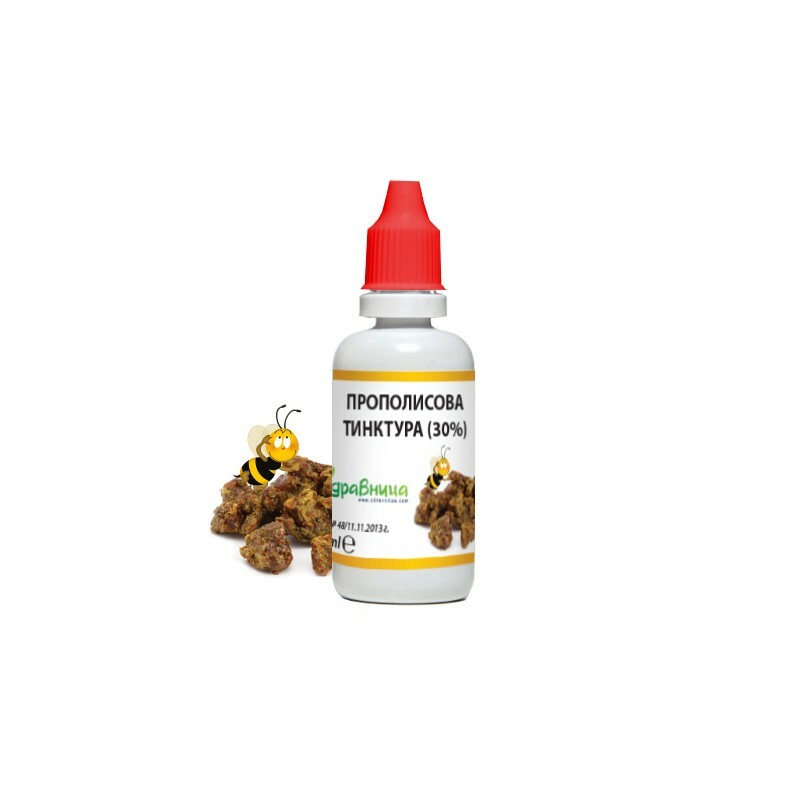 Propolis is a mixture of resins, wax and pollen of plants enriched with enzymes and subjected to lactic-acidic fermentation in the digestive system of bees. Apart from the treatment of certain diseases, the overall strengthening of the body and the increase of its resistance, the bee products and especially the honey are also suitable as a daily healthy diet.